I sent off a postcard the other day. 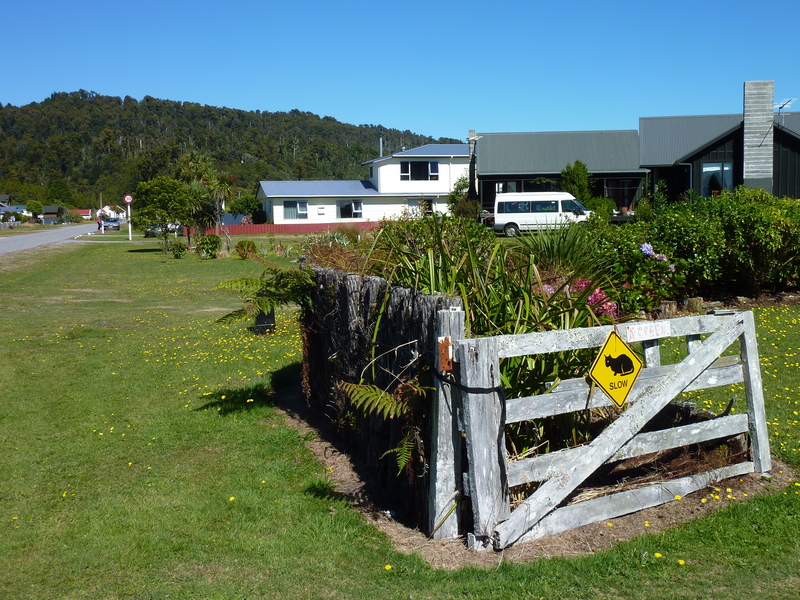 The picture, I felt, was the quintessential image of the New Zealand countryside. The glossy photo showed rolling green fields bordered in flax and populated by hundreds of puffy white sheep. I couldn’t find the postcard I wanted to send, the one that would have been just as fitting but heaps more comical. The postcard I wanted would have looked much the same, but instead of the cute sheep it would have shown hundreds of thorny red deer. It would have shown a never-ending field of fenced in deer because this too is the face of much of the southern planes. Now, where I come from you don’t find deer on the farm with the sheep and the cows so I got to wondering. How did these foreign animals arrived on this remote island and who decided to fence them in on a pasture? As it turned out, the story behind these wild animals’ home on the range was a true kiwi tale that marked the beginning of a rigorous conservation effort in the nation’s largest reserve, Fiordland National Park. 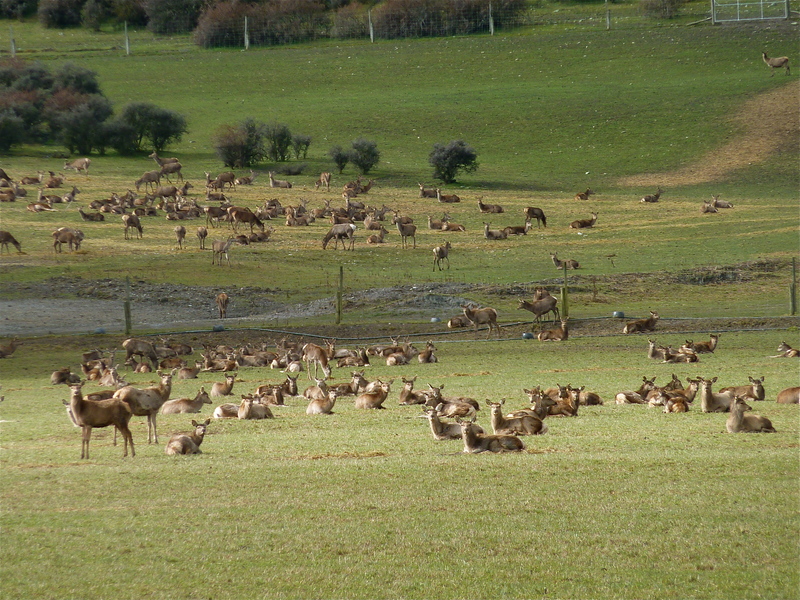 The red deer arrived with the early-European settlers who sought to fill the forests of their new homeland with a huntable population of easily adaptable mammals. In came the deer, instantly taking to their lush new surroundings along the waters of Lake Mapourika and flourishing at outstanding rates, severely disrupting the local ecosystem. In response, the government (in the early days of conservation) sent in a squad of hunters to lower the ever-expanding population. When the hunters were ill equipped to do the trick, they called in the helicopters and declared an all out war with aerial weaponry. Meanwhile, the local Southland population developed a liking for the taste of their enemy and got an idea. Instead of killing the deer, they would capture them to raise on their farms. Thus, the hunter became the captor, diving into the bush with hands outstretched and hopes of wrestling down a doe for a handsome sum. It was a dangerous albeit lucrative change of occupation. 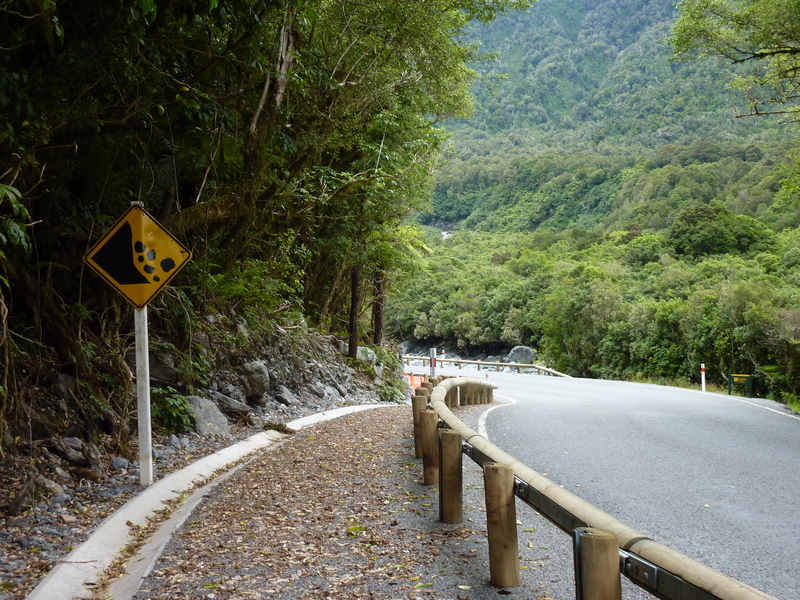 Henceforth, the farm-raised venison industry grew steadily and once the deer problem was tackled (pun intended), Kiwi environmentalists swooped in and set out to rid Fiordland National Park of its other invasive mammals. Unfortunately, the stoats, rats, and possums were less delicious. 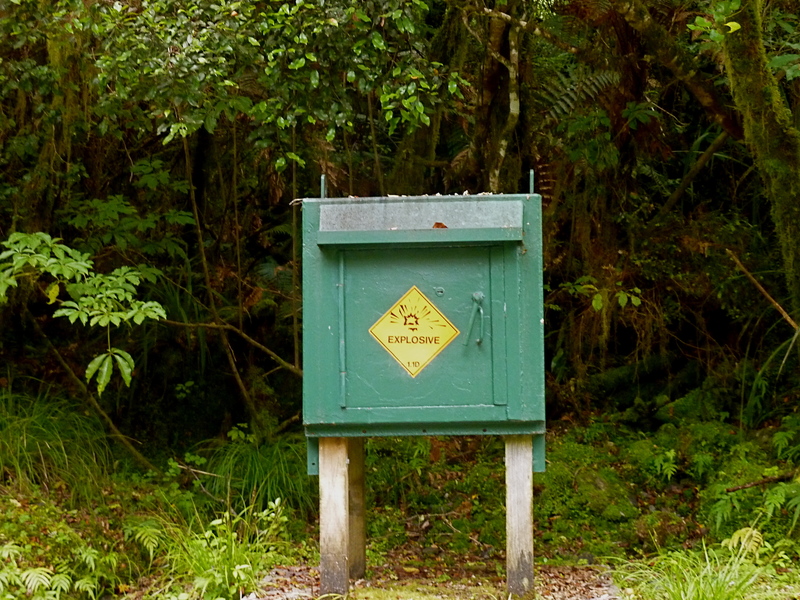 Traps were set in strategic inlaying islands with the goal of creating predator free havens for a handful of New Zealand’s quirky, defenseless, native birds. 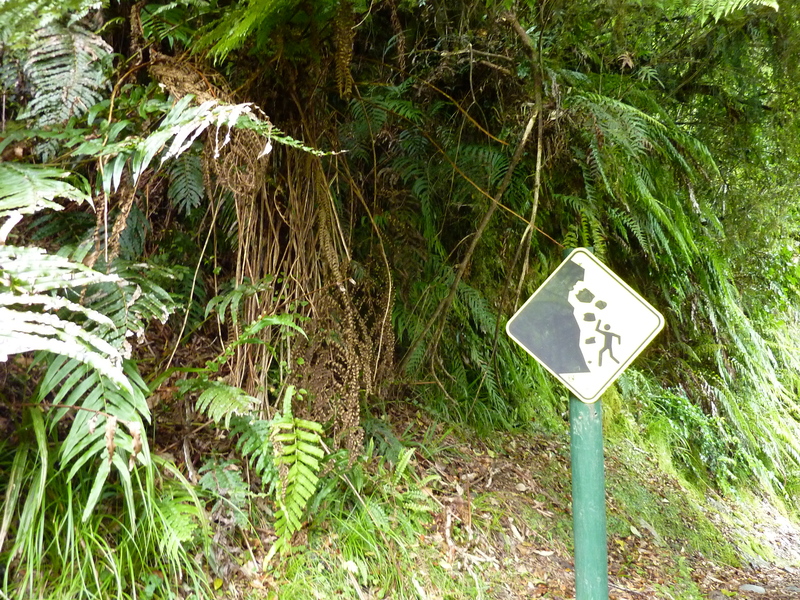 New Zealand was a country void of mammals (bats excluded) before human intervention. Once a kingdom governed by large flightless birds, early hunters and European introduced foreign mammals have decimated some of the world’s strangest creatures. Fortunately, the tides have changed and there is a strong effort under foot to remove all invasive species from the land. Conservationists hope to bring back the populations of the hapless indigenous birds who stand no chance in a land populated by mammals. The vast majority of these endangered birds can only be found in Fiordland National Park in the remote southwest corner of this remote country. 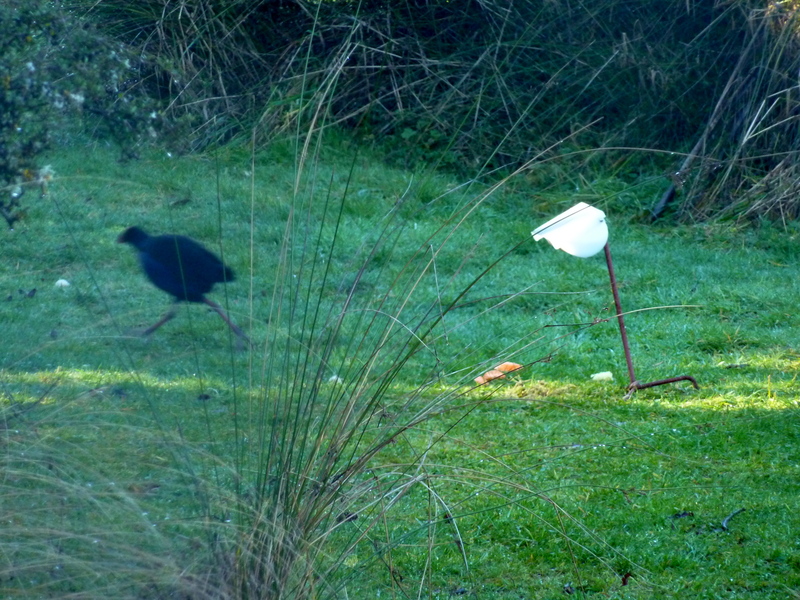 I went to the Wildlife Center in Te Anau to catch a glimpse of one of only two Takahe kept in captivity. Presumed to have flown over from Australia, several generations in enemy-free New Zealand left these birds with wings that grew smaller and smaller and bodies growing larger and larger until they became the fat, flightless Takahe we see today. However, their homeland is no longer predator-free. With an estimated population of around 200, the Takahe hovers on the brink of extinction. The fact that there are 200 of these birds at all is a tribute to their conservation. In the 19th century only four were seen alive and by 1930, the species was presumed extinct. The Takahe was “rediscovered” in the Murchison Mountains of Fiordland in 1948 by Dr Geoffrey Orbell who became mesmerized by the bird’s pelt at the Otago Museum and spent much of his life in Takahe’s pursuit. Fiordland National Park is also home to the approximately 60 remaining Kakapo, all of which live on predator-free islands in the park. The pea-green Kakapo holds many distinctive titles. He is the world’s rarest parrot, the only flightless parrot, the only nocturnal parrot, and at around 3.5kg (8 lbs) he’s also the fattest. 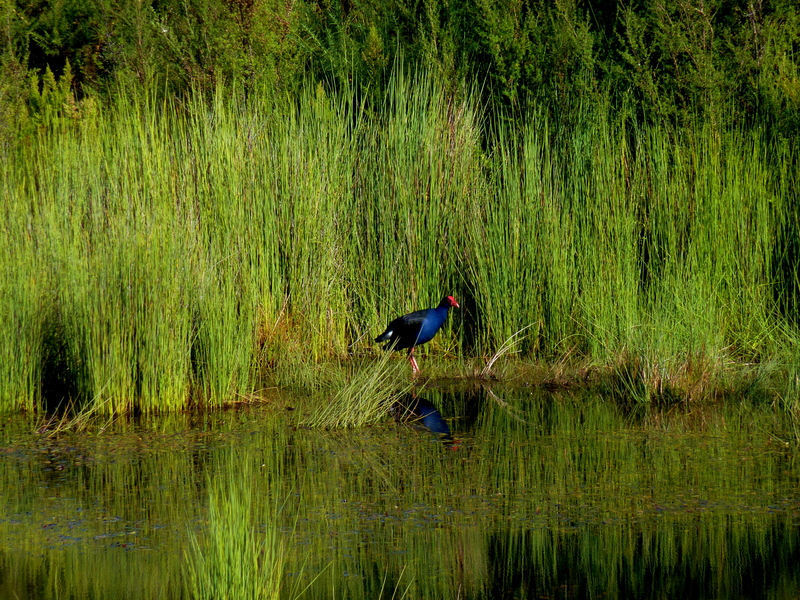 At the fringe of the park and throughout the North and South islands lives the common Pukeko. Takahe’s sleeker cousin, the Pukeko is a national treasure. A more recent arrival in New Zealand than it’s flightless cousin, the royal blue Pukeko can fly if he must, though his flight is a touch dowdy. 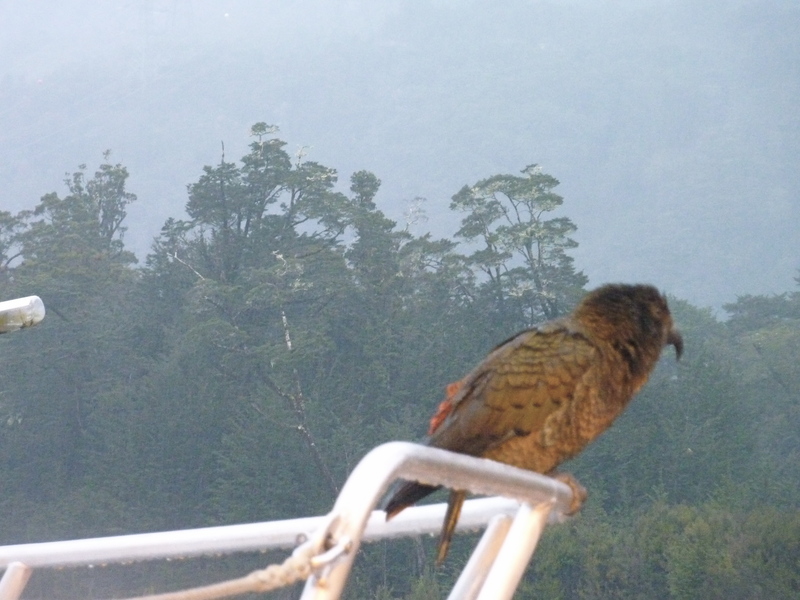 If the Kiwi is the country’s beloved king of birds, then the Pukeko is surely the queen – and if their court had a jester, the cheeky alpine Kea parrot (SEE ICE ICE BABY) could certainly entertain for hours. These three birds can be found in plush toys, on key chains, on your shirt, on a mug, as a lawn ornament and starring in kids films and books. They are the awkward rock stars of New Zealand wildlife. Yet, at the end of the day, it’s the Kiwi that is the endearing symbol of not only the conservation movement, but the country as a whole. 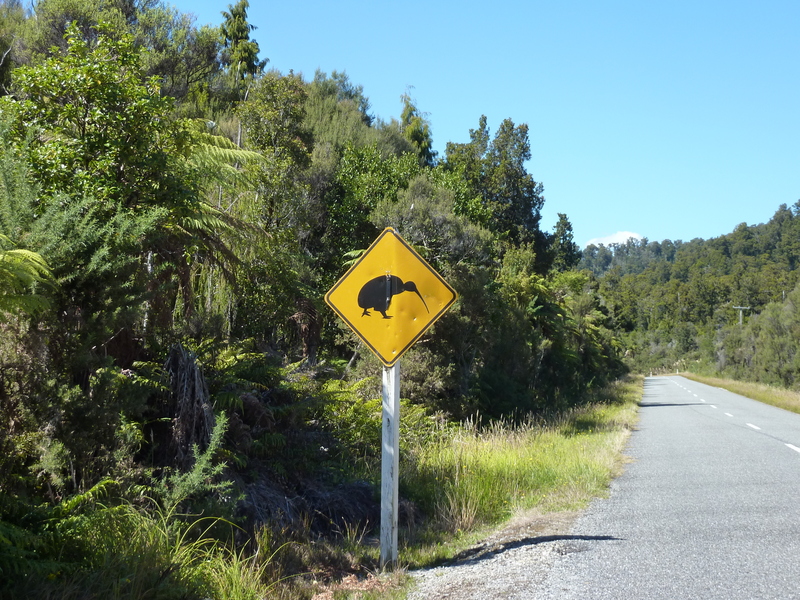 There are five species of Kiwi throughout New Zealand, all of which are endangered, and one of the largest concentrations (Southern Tokoeka) live in the Fiordlands. I’ve often wondered why the Kiwi was put on its pedestal. Who put the plight of this bird above all the rest? Surely it can’t be for its looks. There are plenty of brighter, flashier birds with equal credentials to fill the Kiwi’s role. How did Kiwis come to represent a nation – to name its people and market their favorite fruit? The Kiwi as an emblem first appears in the late 1800’s on regimental badges and gained international recognition in the early 1900’s with Kiwi Shoe Polish, a popular item with Yanks and Brits during WWI. The more I researched, the more I began to understand why the Kiwi is so treasured. 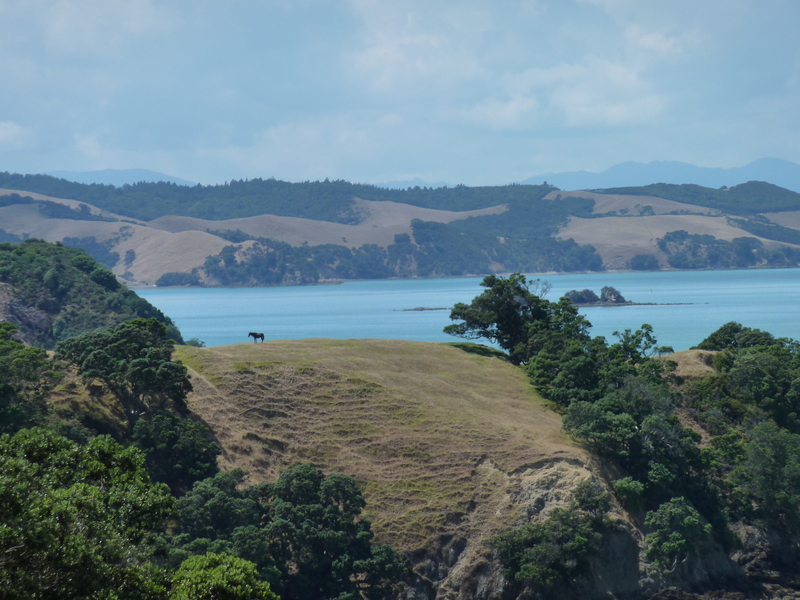 Having roamed these islands for the past 60 million years, they are the ancient New Zealanders. Although partially blind and slightly clumsy, they are sharp, alert birds that can outrun the cleverest humans. Furthermore, they are virtuous and, once bonded, live their entire lives as monogamous couples. 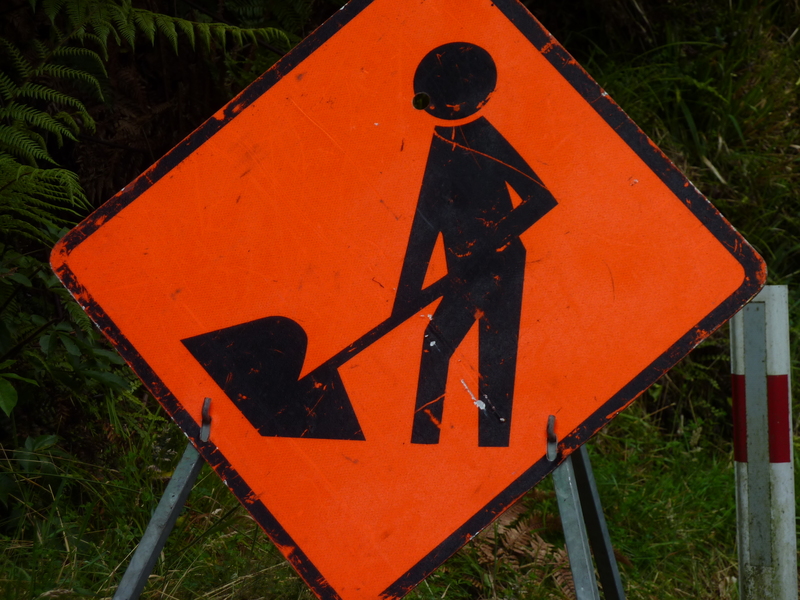 Kiwis (the people) are noted for their quite individualism, ingenuity, resourcefulness and quirky manner. Lacking the nationalistic symbols of more established countries, New Zealanders are nevertheless extremely patriotic. They draw their pride from the unique beauty of their country and it’s creatures. Therefore, it is only logical that these smart, quirky, resourceful birds whose 60 million years on this land nearly came to an end at the hands of Kiwis (the people), would represent the hopes and ideals of a relatively new nation searching for an identity. With the deer on the farm, and the stoats, possums, and rats in their traps, the hope is that the critically endangered Kiwi, Takahe, and Kekapo will once again bumble through their peaceful home. In a remarkably short period of time, they have gone from freebirds to jailbirds. We can look back in shame at the naivety of this nations early settler, but that would get us nowhere. Now, we have only to look forward and hope that these isolated, predator-free islands can maintain and foster New Zealand’s original inhabitants. 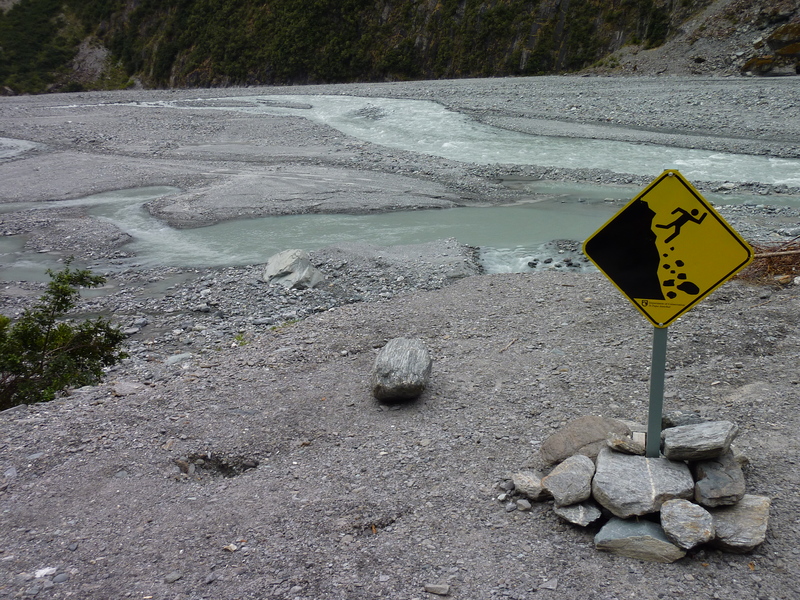 I have an odd obsession with signs – I’ve been photographing them religiously ever since I arrived in NZ. Perhaps, it is a fascination with how we use symbols to communicate with each other when words cannot. 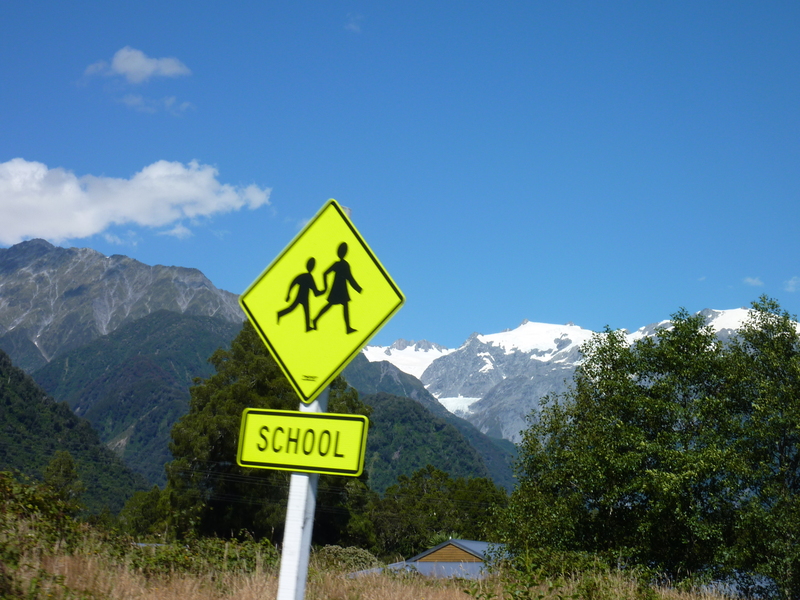 Perhaps, I like the way these florescent signs look against the muted colors of New Zealand’s landscape. 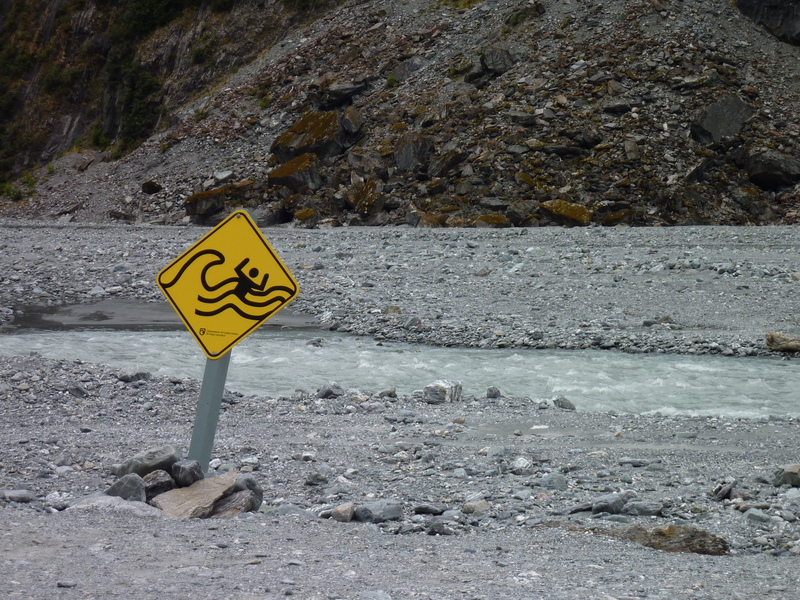 Either way, I’ve found that the most dangerous warnings also the funniest. Some signs are cute, others are horrific, and a few are paired with perplexing text. 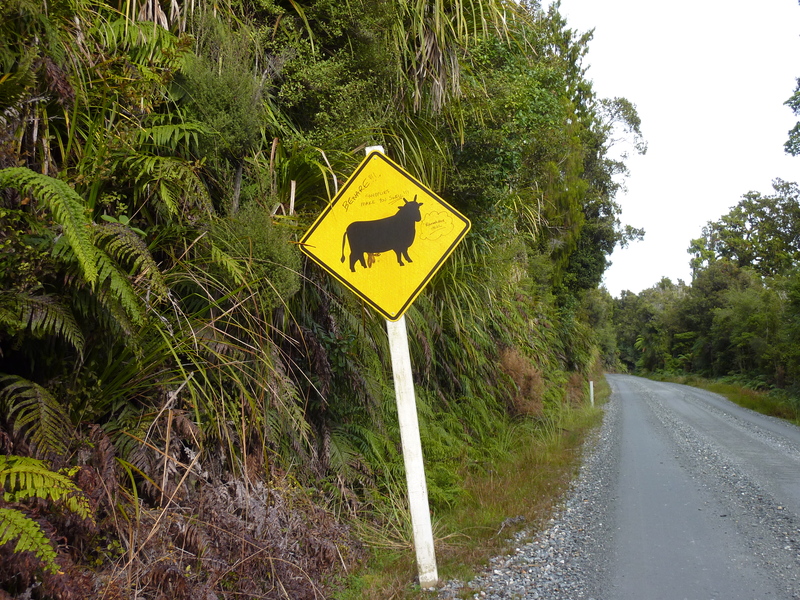 So, as MarkontheMap prepares for some serious trekking and the subsequent South Island Roadtrip, we’ll call this a “bye-week” and take a look at some of the curious signs of Kiwi Land. From here on out, things will be getting a lot more exciting! 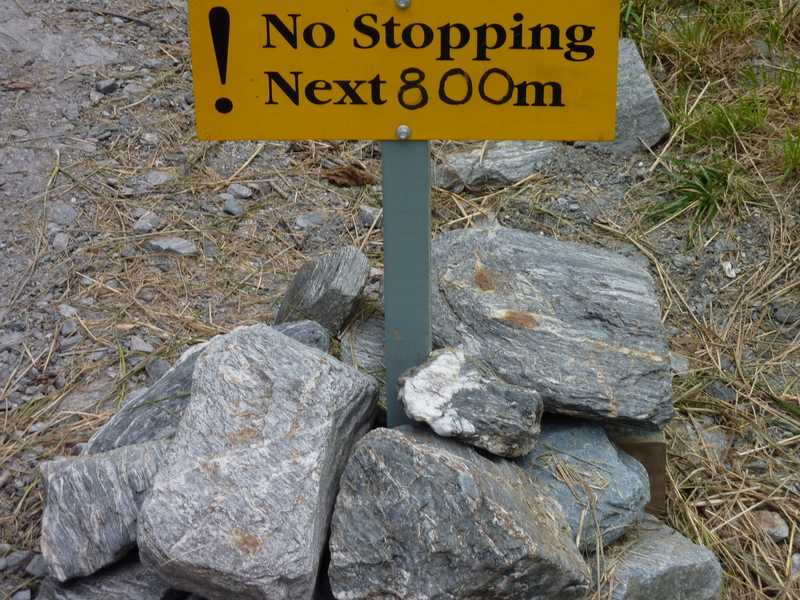 Next week, I am away from the blog as I head deep into the Fiordlands on the southwest tip of New Zealand on the multi-day Milford Track (the so-called, “finest walk in the world”) from Te Anu into Milford Sound. 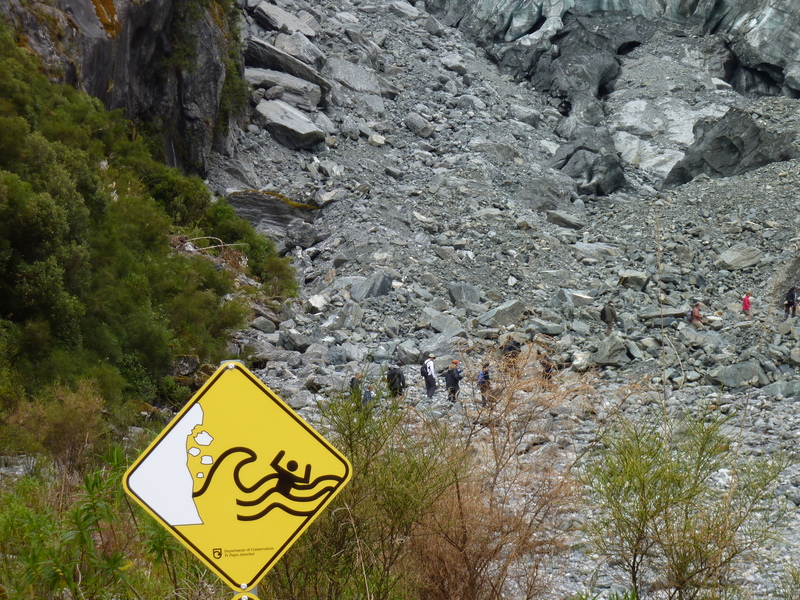 Upon my return to Franz Josef, I have one week to pack up my things before some serious road-tripping begins. 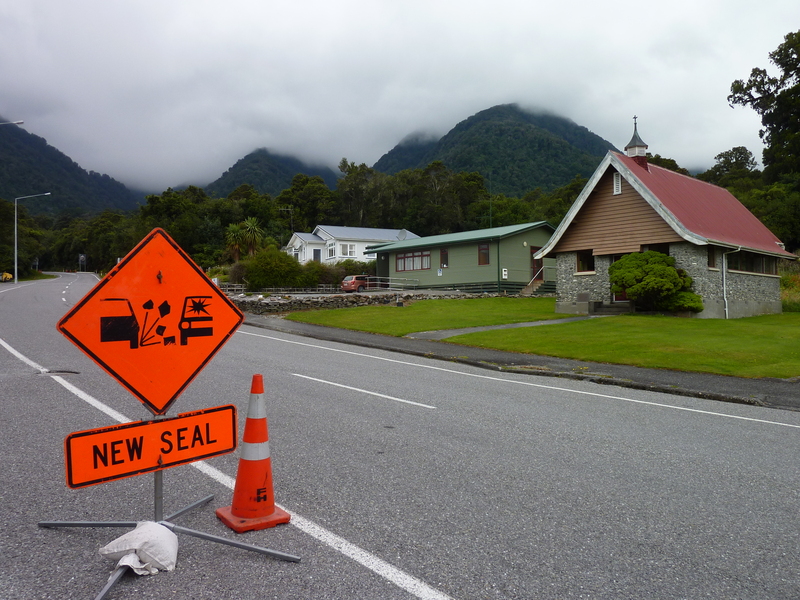 While I will miss this small town by the big glacier in the heart of the wet rainforest, I am anxious to get out of the West Coast and see what lies on the far side of the Southern Alps. I’m not sure where I will be going (south to start), or how long I will be on the road (until I find another job? ), but the true Kiwi adventure is about to begin. Nappies are diapers – That’s one I do know. I found this out after my mate received a call from the pier informing him that there was a jumbo box full of nappies waiting for him. He hadn’t ordered any, but he went ahead and got the box anyway, figuring to make a few bucks off it. But I digress. I arrived in Auckland three days ago in a huge Air New Zealand plane with thousands of movie options, impeccable service (including several costume changes), and most importantly: unlimited glasses of wine to knock me out for the 13 hour flight. Unlike the first leg of my journey with the deaf-mute, this time my neighbors were a cute Indian couple from Chicago who had all sorts of trouble with the in flight entertainment system. Finally, I set them up with some James Bond (“put on some action, some gun fighting”) and we all fell into a happy slumber. I woke up in New Zealand and began the awkward process of collecting my bags and stating my purpose in the country. 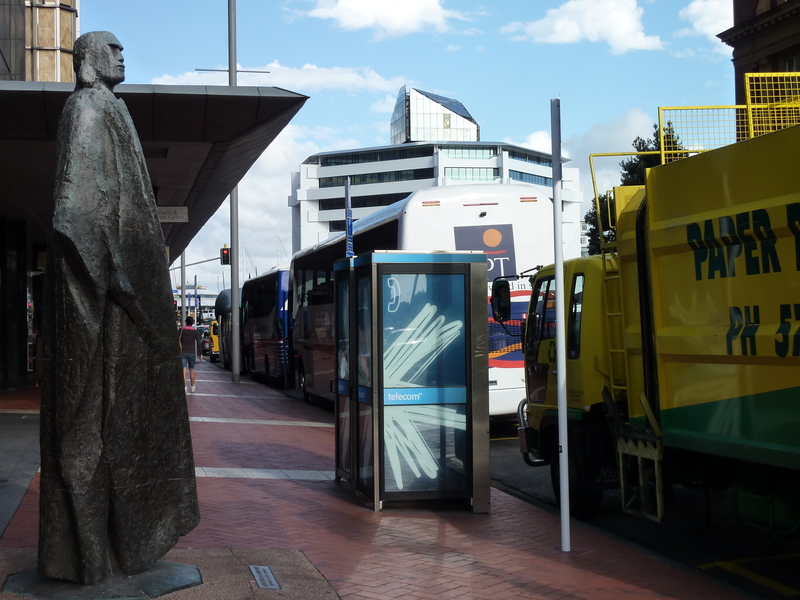 A short bus ride found me in the Central Business District where I checked my bags at Auckland Central Backpackers and set out on the town. When I first arrive to a new place I like to take a walk around to get my bearings. 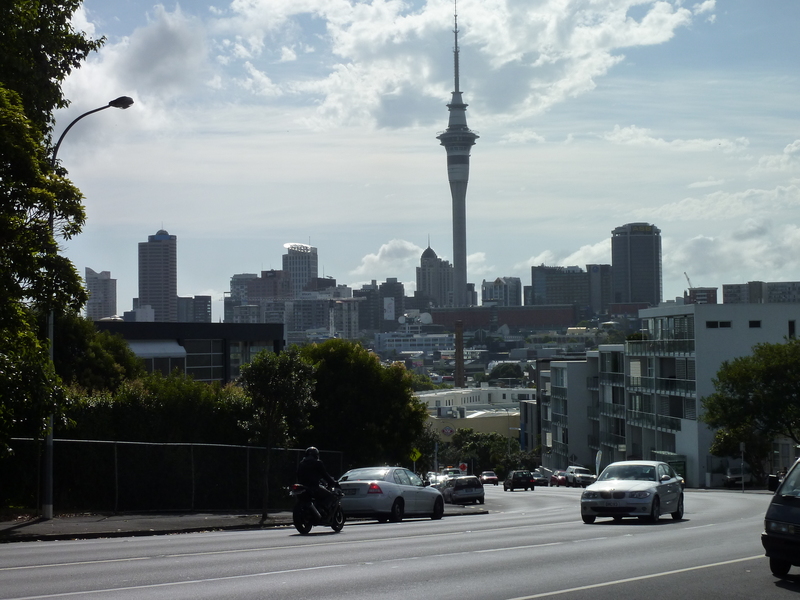 During my long walk, I decided that Auckland is the cleanest, most pristine city I have ever been in. There is no trash on the ground, lots of trees and green space, and I have yet to see a homeless person. I couldn’t even find anywhere that one might call “the bad part of town.” Nobody looks menacing. Instead, they all look uber-hip. Every restaurant is Asian and everyone is skinny except for the Samoans you see walking around with Samoan T-shirts and visors. The first night I crashed early. I spent the following day opening a bank account, applying for a tax ID #, getting a Vodafone phone #, and taking care of other logistical necessities to make my presence legit. I walked the length of the harbor, hit up a few galleries in the Auckland Art Precinct and a stopped by a few museums but, all told, Auckland does not have a great deal of attractions. 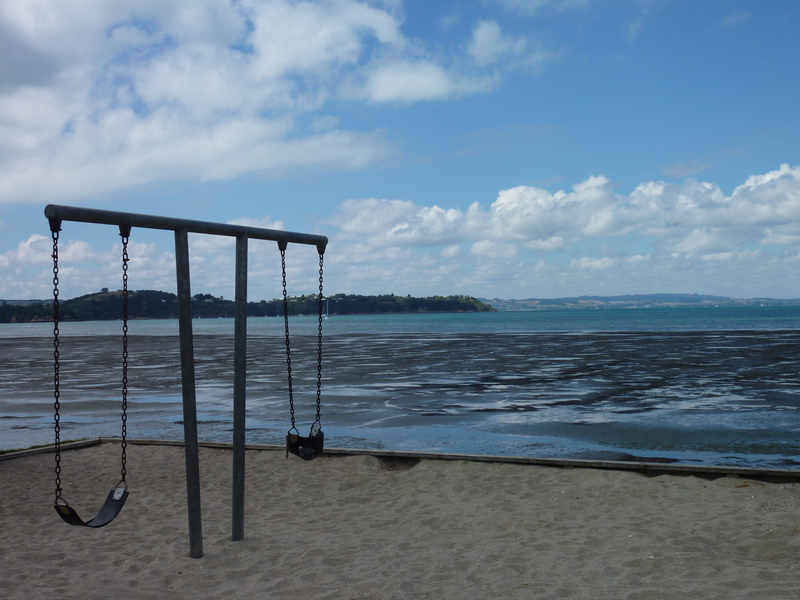 Everyone I spoke to told me the beauty of Auckland is getting out of Auckland. So I did just that. While I was at the travel desk at my hostel pondering a trip on the Beach Bum Bus on Waiheke island, Mr. Beach Bum Bus himself walked in and I took it to be a sign. 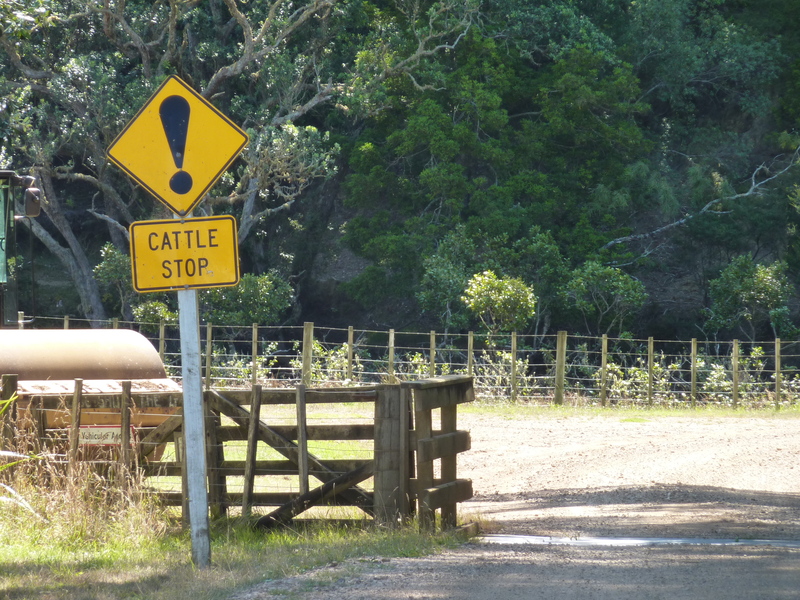 I hopped the ferry early the next morning and arrived at Waiheke Island in the Hauraki Gulf thirty minutes later. I was the only one signed up for the day, so it became “choose your own adventure,” which I love. We pulled out of the ferry dock, Dan put on some reggae dub music, and the island began to feel eerily familiar. Apparently Reggae music is huge in New Zealand and we listened to various Kiwi groups throughout the day. The roads were small, hilly, at times unpaved, and I felt like I was back at home in the Virgin Islands. We got some coffee at Lazy Lounge and headed across the small township of Oneroa to the Waiheke Community Art Gallery. Having learned I was a glass blower, Dan introduced me to a sweet old lady who showed us some wonderful New Zealand glass art by Keith Mahy and others. Later on, I took a hike through the bush looking for the endemic Tui birds and hit up a few beaches before heading to Dan’s secret fishing spot on the edge of an oyster farm. I am not the seasoned fisherman that one may assume when they hear Virgin Islands. In the VI you can’t eat the fish you catch off the shore because you are likely to get Ciguatera, so fishing requires a hefty boat trip. Here, it is a different story and Dan wanted to catch some Snapper for us to cook up for dinner. As it turns out, I am a pretty good fisherman. I was the only one to catch a fish, but it was not the nibbling but elusive Snapper. With fishy hands and fishy shirts, we made our way to Topknot Hill for a little wine tasting. The wines were okay, but the ambiance was a bit odd. 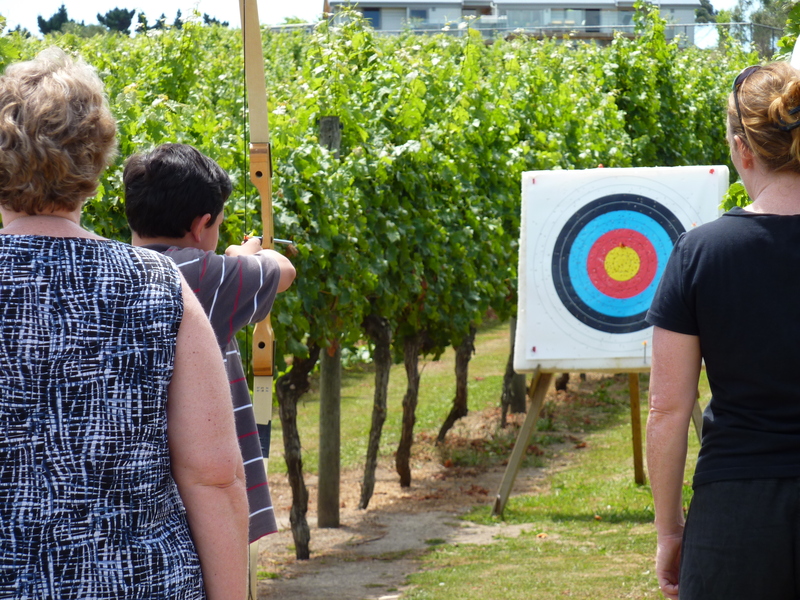 Several kiwis were disc shooting in the field while others practiced their archery skills between the rows of grapes. It was definitely a far cry from the vineyards I have visited in the states. It was a beautiful sunny day, perfect for my Beach Bum adventure. However, New Zealand has the highest skin cancer rate in the world. It turns out there is a giant hole in the ozone layer over New Zealand formed by reflected sunrays from Antarctica. I hardly felt close to Antarctica on the sunny island of Waiheke, but the sunburn on the back of my neck was and is a harsh reminder. Dan dropped me off on the path leading through the bush to my hostel, Hekerua Lodge. It was around dinnertime and I immediately found myself in the pool chatting with a Kiwi woman who used to work for Royal Caribbean back in the eighties. She got fired for inappropriate behavior with a passenger and is still bitter about it. We jokingly called her a Cougar and kept our distance, but she insisted she liked much older men so we opted for Saber Tooth Tiger instead. She was very distraught about a mass murder that has been on the cover of the New Zealand Herald for days now. It is the biggest story in the country… how could this man have killed all of those dogs? In today’s paper was a picture of a puppy that miraculously survived by hiding under his dying mother. It’s all very sad, but she was using this story to prove to me how New Zealand isn’t as safe as I may think. I am pretty sure with a murder rate of .01 per 1000 people I will be just fine. 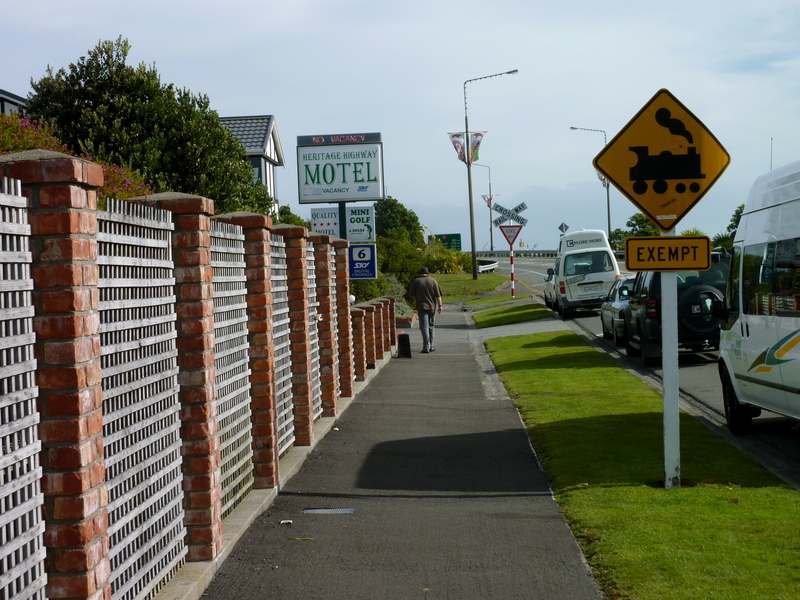 Later on, a small group of us backpackers headed to the mini mart by Little Oneroa Beach to grab some dinner. I ended up sitting in the sand with a Czech girl named Zuzi, passing a bottle of Sauvignon Blanc back and forth as the sun set. It was all very romantic, until I woke up with her cold this morning. My throat and head hurt, and I thought I was going to puke on the ferry ride back to Auckland. Thanks Zuzi!